Prof. Dr Zhigang Chen is currently a Professor of Energy Materials and Honorary Assocaite Professor in the School of Mechanical & Mining Engineering, the University of Queensland. Dr Chen received his PhD from the Institute of Metal Research, Chinese Academy of Sciences in 2008 under the supervision of Professor Hui-Ming Cheng, and Professor Gaoqing (Max) Lu. His research focuses on thermoelectrics for power generation and cooling; next-generation optoelectronic devices and functional System; topological insulators for next-generation chips; and high-speed sensors. 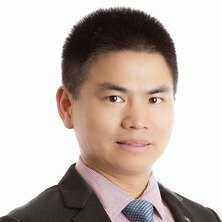 As a lead Chief Investigator or Chief Investigator, Dr Chen has succeeded in winning 4 ARC Discovery grants (three are first lead CI and other one is APD Fellow), 1 ARC Linkage, 1 ARC LIEF grant, more then 10 Industry Investments, 2 Queensland smart future funds, 1 international linkage grant from the Australian Academy of Sciences, 1 UQ foundation excellence Award, and 4 UQ grants. Dr Chen has contributed more than 200 original journal publications (including top ranking journals, such as Nature Nanotechnology, Nature Communications, Advanced Materials, Journal of the American Chemical Society, Angewandte Chemie-International Edition, Energy & Environmental Science, Nano Letters, Advanced Functional Materials, Advanced Energy Materials, and Nano Energy), 4 patents, and over 30 invited talks or oral presentations. His publications have been cited > 11000 times (ISI web) with H index of 52. Thermoelectric materials directly convert thermal energy into electrical energy, offering a green and sustainable solution for the global energy dilemma. This proposal aims to develop inexpensive, abundant, and low-toxic thermoelectric nanomaterials for high-efficiency energy conversion using novel industry-level approach, coupled with nanostructure and band engineering strategies. Identifying new approaches to develop energy-saving methods and tap into new renewable energy sources is set to be the greatest challenge of the 21st Century. Thermoelectric (TE) energy is one of the approaches that offers great promise as it can be used in multiple applications for power generation and refrigeration. It can create electricity from waste heat at any scale, it can significantly improve energy efficiency at a medium industrial scale, including significantly improving vehicular weight and emissions, and it can even generate electricity or cooling at the nanoscale. For instance, it could potentially be used to convert body heat into electricity in clothing or to charge a cell phone. The thermoelecric materials developed by Dr Chen have extremely high hopes for this technology. Imagine if the "information superhighway" had HOV lanes so that data could be stored, processed and disseminated many times faster than possible with today's electronics. New topological insulators developed by Dr Chen will be used for this new generation devices, such a speedway for future devices, an exotic type of electrical conductor. PhD in Materials Science and Engineering, Chinese Acad.Sc. Superfast information technology had HOV lanes so that data could be stored, processed and disseminated many times faster than possible with today's electronics. This project aims to develop new topological insulators using chemical vapor depostion and coupling unique nanostructure and band engineering strategies. The ultimate target is to be used for this new generation devices, such a speedway for future devices, an exotic type of electrical conductor. The direct energy conversion between heat and electricity, based on thermoelectric effects without moving parts, has been considered as a green and sustainable solution to the global energy dilemma. This project aims to develop novel band-engineered metal selenides for high-efficiency energy conversion using novel microwave assisted wet chemistry approach, coupled with nanostructure and band engineering strategies. The key breakthrough is to design high performance metal selenide thermoelectrics for satisfying the high efficiency solid-state devices. The expected outcomes will lead to an innovative technology that waste heat recovery and refrigeration, which will place Australia at the forefront of practical energy technologies. Chen, Z., Zou, J., Liu, G., Feng, L., Lu, G. and Cheng, H.-M. (2007) Synthesis and photoluminescience of CdS nanocones. Chinese Electron Microscopy Society, 26 5: 423-427. Chen, Z. G., Zou, J., Li, F., Cheng, H. M. and Lu, G. Q. (2007). Growth of magnetic yard-glass shaped boron nitride nanotubes with periodic iron nanoparticles. In: The 4th China-Korea Workshop on Nanotubes and Nanowires. The 4th China-Korea Workshop on Nanotubes and Nanowires, Yanji, China, (). 27-30 May, 2007. Chen, Zhi-Gang, Zou, Jin, Lu, Gao Qing, Liu, Gang, Li, Feng and Cheng, Hui-Ming (2007). Improved property of core/shell ZnS/BN nanowires. In: Materials Today Asia 2007, Beijing, China, (). 3-5 September, 2007.